Calgary – In a vibrant celebration of history and cultural pride, the 2018 Calgary Stampede Indian Princess will be selected and crowned this Sunday, September 24, 2017. The Calgary Stampede Indian Princess represents all five nations of Treaty 7 - Kainai, Tsuut’ina, Stoney Nakoda, Siksika and Piikani – as well as Indian Village and the Calgary Stampede. 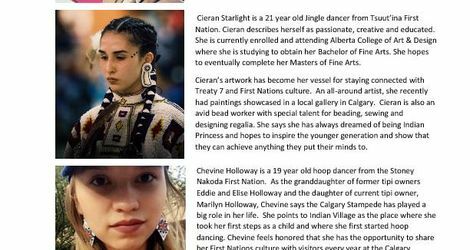 The 2018 Indian Princess will make hundreds of appearances locally, nationally and internationally throughout her reign, educating those she meets about First Nations cultures as well as their connections to the iconic Calgary Stampede. NOTE: Interviews and photo opportunities with the 2018 Indian Princess will be available following the crowning ceremony.